Paella with a twist! 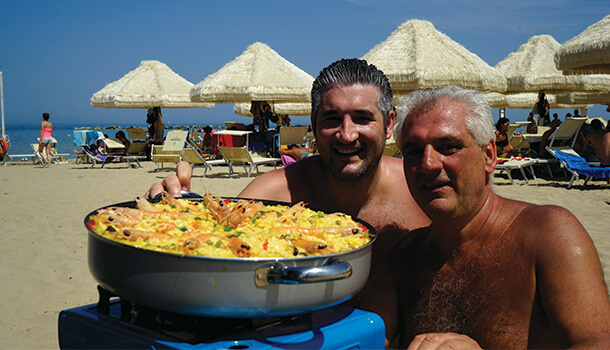 This Italian style-Paella dish is inspired by my family in Venezuela and brings the delicious salty flavours of the Adriatic sea, to your plate. (For a big Family lunch of approx. 20 ppl) Use less ingredients if you cook for less people. Boil 4-5L water in a large pot while you prepare the ingredients for this amazing dish. Dice the carrot, capsicum and onion into small pieces. Prepare the calamari by cutting the calamari strips into cubes. 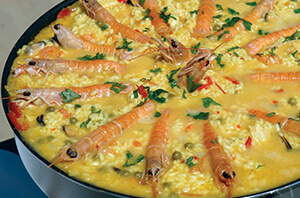 Pour a generous drizzle of extra virgin olive oil into a large deep pan and put it on the stove at a medium-high heat to start the paella mixture. Add the capsicum, carrot and onion to the pan and stir. Leave to simmer until the vegetables begin to soften. Add the calamari pieces and simmer for around 10 minutes while stirring regularly. Once the water has started to heat up, add 2 x sachets of saffron powder to the large pot. Next it’s time to add the diced chicken to the mix and stir using wooden spoon. This should also be left to cook for 5-10 minutes. Add the prawn and saffron broth using a large ladle and stir it through. Then, pour in the rice, stir once again, and add another 2 ladles of broth. VINCENZO’S PLATE TIP: In this recipe, we used Arborio for an Italian twist, but it is recommended for authenticity, to use “bomba” which is a short grain rice. 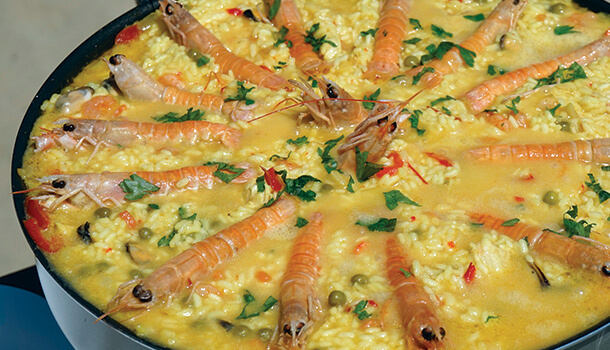 To add extra flavour to your paella, add a sprinkle of sea salt and mix, before pouring in up to 200g of peas. Continue to stir frequently, until the rice is par-boiled. Then, add the prawns, mussels and scampi. Place the scampi evenly around the pan so that they rest on top and are able to cook whilst looking on-point for presentation. Once the paella is almost ready, add a few sprinkles of finely chopped parsley. 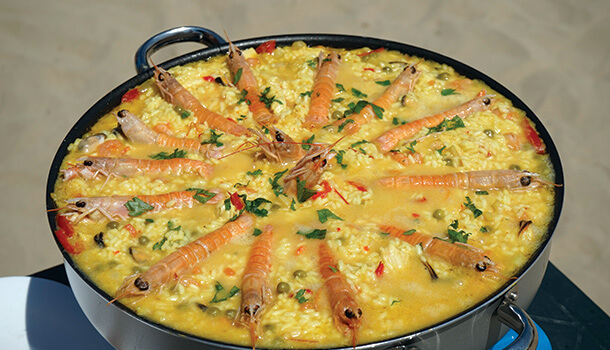 Serve up a generous portion of paella on a flat coloured plate and add a scampi on top in the centre.